211 Bernard: The Librairie is Thick with New Peaches! The Librairie is Thick with New Peaches! It's brand-newest issue of fuzziest food mag in the orchard! Look at this gorgeous cover! 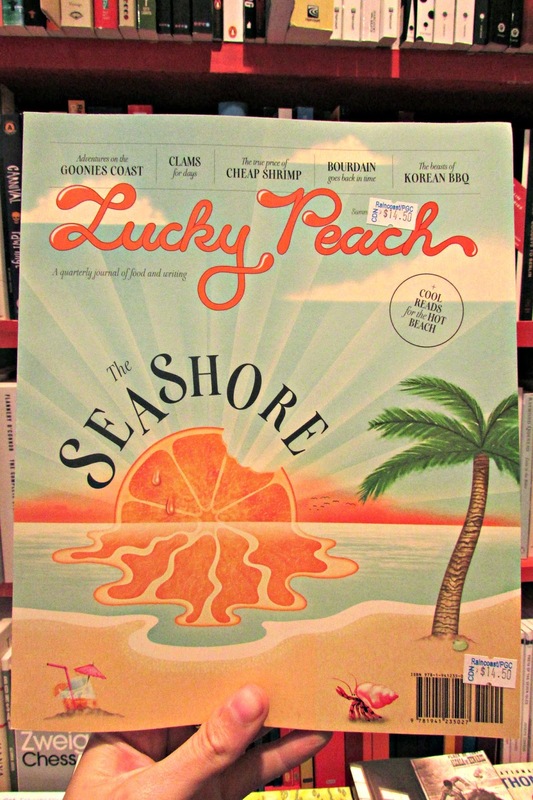 Don't let these recent rainy days and icy eves get you down, there still some summer to be squeezed outand the newest Lucky Peach would make a welcome addition to some pre-labour day vacation plans. CLAMS, Bourdain, Korean BBQ, CLAMS, An oral history of fishing in Gaza, CLAMS, A revised History of the Harvey Wallbanger, The True Price of Cheap Shrimp, CLAMS, Northern California's Seafood Harvesters, Sea Cucumbers, CLAMS, CLAMS, CLAMS, CLAMS and more! Dock your trawler at the salty ol' D+Q marina and grab your copy today!